Step 1. Cut a shape out of double-sided metallic board. Step 2. Place that shape over another piece of the metallic board. 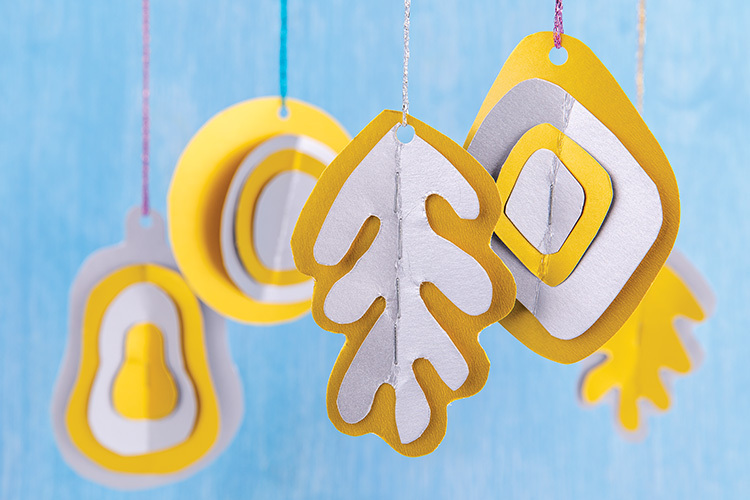 Using this shape as a template, carefully cut around it leaving a 1cm border- so that the second shape is larger than the first. Step 3. Continue this process so that you have 2-4 shapes, each one slightly larger than the others. Step 4. Place the shapes on top of each other – largest to smallest, alternating facing sides. Step 5. Staple all shapes together at their centre. Step 6. Carefully fold each layer up (in the direction of the staple). Do not fold the base layer. Step 7. Create a hole using a hole punch, and add a hanger. Extension: Experiment cutting various organic, festive and geometric shapes and designs.